Anne! congratulations, Anne! we’re so happy for you! we’ll be sending you an email soon to get your info. thanks to everyone who entered! and a very big THANK YOU to all the etsy shops who participated!! Merry Christmas everyone! Hi! My name is Brenna. I started my Esty shop a few months ago so I could “work” from home and be with my 6 kids while my husband finishes nursing school. I have always enjoyed working with digital images, and Etsy has given me the opportunity to share my interest with others (besides my family and friends). 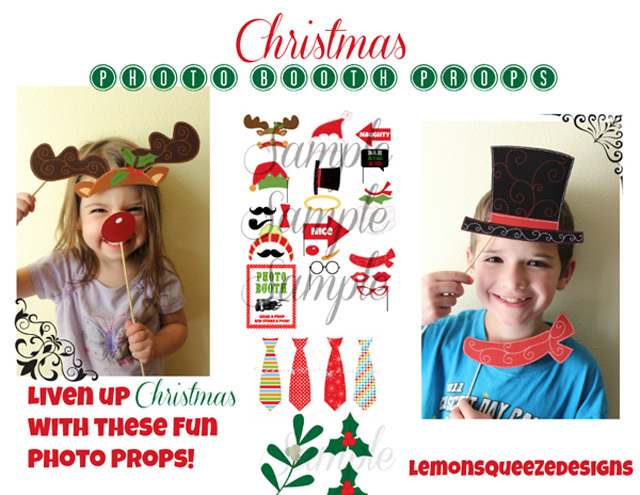 In my shop you will find a variety of items ranging from Photo Booth Props, Lunchbox Notes/Jokes, Subway Art, Goodie Bag Toppers, Bottle Cap Necklace Images and more! Before starting my shop I noticed that some of these items can get pricey elsewhere on the internet. My goal is to make these items affordable to everyone. Please stop by and take a look, and don’t forget to pin to Pinterest as well! Thank you! 1. head on over to Lemon Squeeze Designs, find something you like, then come back here and tell me what it is you like from their shop in a comment. all entries must be submitted before midnight mst today, december 12th. one winner will be randomly selected and announced on this post tomorrow at 8pm MST. you must be a resident of U.S. or Canada to be eligible. Wow some really cute things! I really like the Santa Christmas countdown. I subscribe, shared on pinterest, follow on pinterest and shared on Facebook. I like the Christmas bingo. I subscribe to LCE, I shared the post on facebook, and I follow you on pinterest and repinned the image. I really like the onesie stickers! I follow and repinned on pinterest, shared on facebook, and subscribe. I like the monthly onesies stickers, very cute. I liked & shared on Facebook. I follow and repinned on pinterest. And i subscribed to LCE .